Tonalpohualli: Count of Days, a solo exhibition by Moira Garcia, will open with a reception this Sunday, November 11, 2018, from 3 pm to 4 pm. 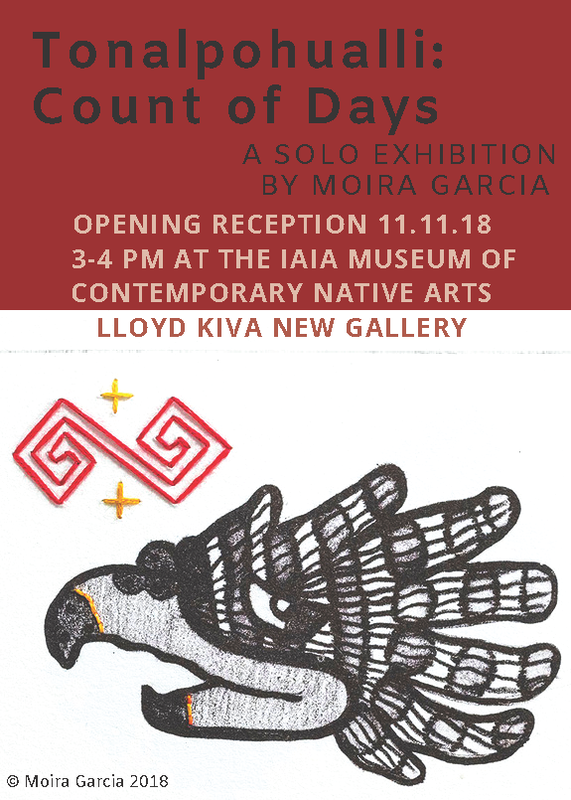 The exhibition and opening is at the Lloyd Kiva New Gallery of the IAIA Museum of Contemporary Native Arts, 108 Cathedral Place, Santa Fe, New Mexico. Moira Garcia is a mixed-media artist, printmaker, and bookmaker residing in Santa Fe. She has a BFA in Studio Arts from the Institute of American Indian Arts, and has also received art training from the Instituto Allende in San Miguel de Allende, Mexico, the University of California in Santa Cruz, and Santa Fe Community College. Born in Gallup, New Mexico, and raised on the island of Kaua’i, Hawai’i, her art reflects her diverse multicultural experience. Her current work explores conceptions of living and lost cultural knowledge, journey, and trajectory of Native America, especially Mesoamerica. She is the founding artist of the initiative Art for Change NM, where art sales support grass-roots social actions that benefit our earth and future generations.